Miami-Dade County is a complex space. The core county-level administrative unit of the Miami megalopolis is characterized by vast socio-economic chasms between the winners and losers of an economy designed to serve the wants of non-locals, rather than the needs of those who strive to survive in the city. It boasts rich diversity in socio-cultural heritage, while paradoxically having the potential of that diversity undermined by our stubborn close-mindedness about each other’s notions of expression and identity. Variety in the physical forms of the metropolitan space nearly matches that of its people, as derelict housing structures stand adjacent to cranes busily erecting ultra-modern and luxurious skyscrapers, almost seeming to taunt the bulk of the population with a surreal notion of ‘home’ they could never imagine, much less afford. In such an extremely differentiated socio-spatial context, it’s easy — almost natural — for our simplification-seeking human minds to extrapolate from what little we may truly know about the other people and other places in the region and arrive at some downright crude (mis-)understandings of geographic reality. The fact of the matter, more often than not, is that we’re making gross over-generalizations based on an extremely limited number of experiences (i.e., based merely on our own anecdotes, mixed with an unhealthy dose of prejudice). This is how we give birth to and collectively perpetuate stereotypes. That includes geographical stereotypes. Let’s define that term, ‘geographical stereotypes‘, as an oversimplified perception of the characteristics of a place, as well as the characteristics of the people who occupy, give meaning to, and derive meaning from that place. Geographical stereotypes abound in an attention-grabbing piece published a couple weeks ago by the popular Miami New Times (MNT) blog: “All 34 Cities in Miami-Dade County, Ranked from Worst to Best“. Staff contributors to the article insisted that they were presenting to their audience the “definitive ranking of each and every one of those communities”. It makes one wonder if the New Times considers people outside the boundaries of the City of Miami proper (ranked #1 on their list) as part of their readership. As a generally pro-Miami media enterprise eager to “defend the honor of Miami“, it is doubtful that New Times staff fully contemplated the ways by which their simplistic narratives of certain pockets of the city, and their inhabitants, could actually serve to exacerbate some of the social challenges faced by these Miami sub-communities. Do the residents, especially the youth, of Opa-Locka benefit in any way from being fed the notion that they’re living in a gang war zone? Will Florida City, one of the most underdeveloped communities in the county, be in a better position to attract much-needed capital investment and raise the quality of life for its citizens when locals and tourists alike are encouraged to keep driving through it? Will the less than 10% Black population living in Palmetto Bay feel any more welcome in their predominantly White/Hispanic-White incorporated village after reading the sarcastic encouragement to deepen the racial divide there? Miami-Dade’s incorporated cities, towns, and villages are so much more than the crude caricatures presented in those rankings. Also, with all the New Times’ talk of cartography and whether certain city boundaries make “geographic sense”, one would hope to see some actual maps accompanying their post. 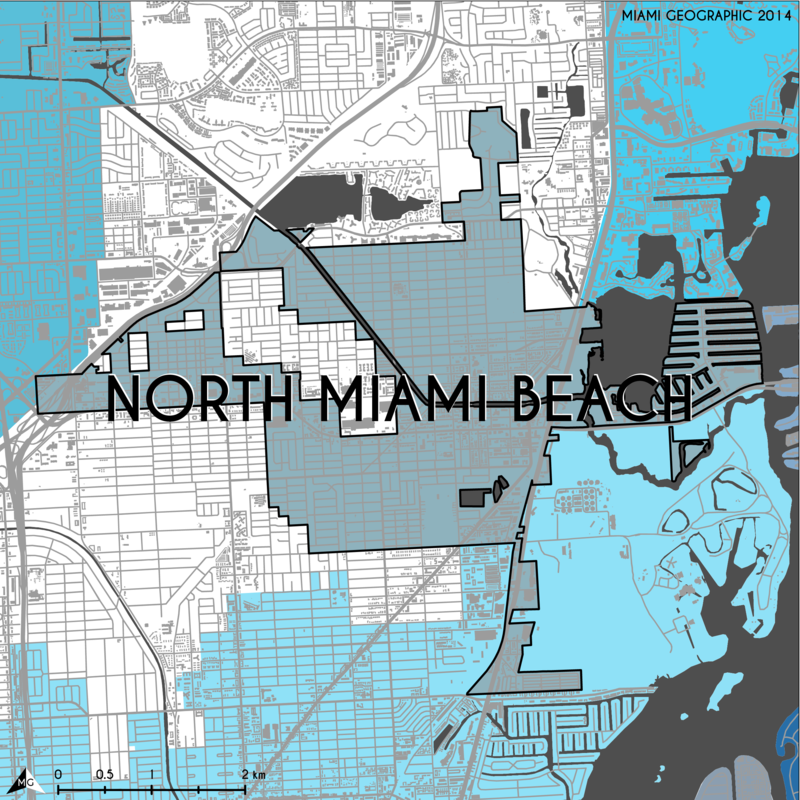 [H]ave you looked at [the City of North Miami Beach] on a map? The city’s boundaries make no geographic sense. There’s a chunk of unincorporated Miami-Dade right in the middle of it, and then there are all these weird narrow parts jutting out of it. Cartography-wise it doesn’t even look like a city. It looks like a dog got a hold of a city and chewed it up. It may seem a bit simplistic, but an underlying axiom of geography is that to understand exactly what certain people and places really are, one must first, at the very least, know where those people and places are. Location matters. And there’s nothing like a map to communicate location. 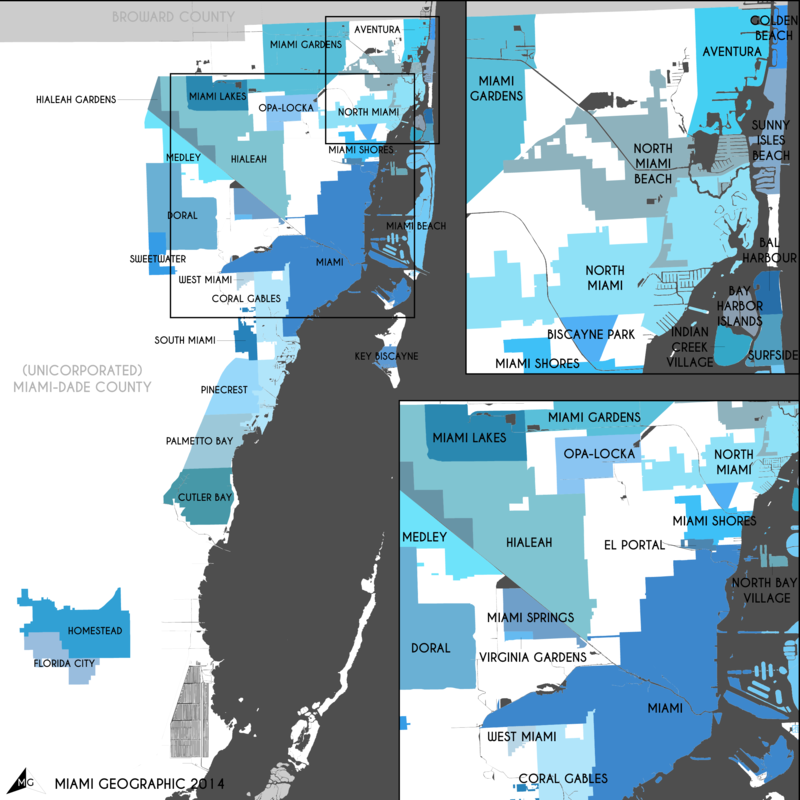 Thus, in an preliminary effort to remedy our collective ignorance about some of those other people and places in Miami that we so often and so conveniently dissociate from ourselves, let’s have a look at a map clarifying the arrangement of Miami-Dade County’s 34 incorporated places. Let’s at least get an idea of where everything is . . .
Miami-Dade County Municipalities, 2014. Source: Matthew Toro. 2014. All right, all right: The New Times wasn’t so far off with regard to the whole North-Miami-Beach-looks-chewed-up-by-a-dog comment. That city in the county’s northeast does indeed have a rather eccentric geometric form. City of North Miami Beach, 2014. Source: Matthew Toro. 2014. The point stands, though: Our shared community consciousness needs nourishment, not some some sensationalized, seeking-to-go-viral post subjectively ranking Miami’s sub-communities based on inherently skewed geographical stereotypes. Miami is so much more than even our most popular, mainstream media outlets give us credit for . . . Very good article and very much on point when it comes to how Miami is much more than what the media portrays it as.